UPDATE: Ok so the original awesome Medieval chess set we featured in this post has seen better days… It’s apparently sold out! Never fear though, Gothic Decor has gone the extra mile, just for you! Here are more awesome Medieval chess sets that blew our minds. The older one is frickin’ gorgeous! Trounce your mortal enemies at the game to end all games with this one-of-a-kind Medieval chess set. The level of detail is breath-taking to say the least! And let’s be honest, your drab old coffee table needs SOMETHING to percolate the conversation every now and then. Pick this lovely item up and never worry about entertaining unwanted guests again! Just beat them at a game of Medieval chess and send them on their way. This has plenty detail on the chess pieces themselves. And It’s one of the more beautiful elevated glass medieval chess sets I’ve seen in awhile. Of course, it’s really the killer dragons that make it happen for me, not the glass. simple and geeky… all in the right way of course! You gotta love the . It must have taken then hours to make the original molds and then only several minutes to mass produce the shape into playable real estate! That’s cool though, technology is a Goth’s best friend these days. Sorry to say so but I already forgot the first one. The first what? Exactly! …but these Medieval chess sets are just getting better and better! Awesome Medieval Castle Base! What will they think of next?! Yeah the whole thing about chess is that it’s timeless, right? You can teach it to your Goth girlfriend on the weekends or maybe even invest in an awesome board to play with your DnD buddies while some jerkoff is STILL rolling for stats. Kill the time in style! Any of these boards would do the trick. I don’t know, I don’t know! 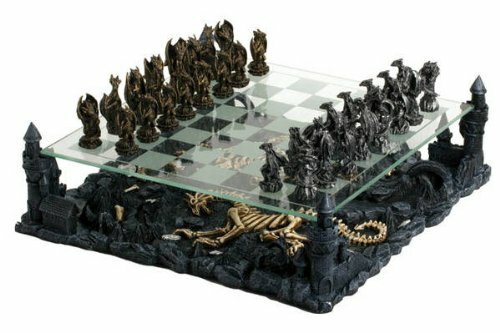 They’re all super unique Medieval chess sets, they’re all awesome, and they’re all absolutely perfect for your Gothic home decor project. You’ll have to make up your own minds because I just can’t!